Chris Martin's Monk, with rider Lindsay Graham, and Doug Swingley, owner and rider of National Security (Nash), are the two US riders who have been invited to participate in the 160-km President's Cup Endurance ride in Abu Dhabi on February 11. Monk has been preparing in California with Martin and Graham, and Nash has been training in Utah at the Global Endurance Training Center with Christoph Schork. The horses will fly out of Los Angeles on February 6th. Abu Dhabi: For the first time in the UAE's domestic endurance history, three foreign riders finished on top in the President's Cup for Junior Riders, the President's Cup for Ladies and the President's Cup for horses privately owned. The Bouthieb Endurance Village in Al Khatem saw over six endurance races over the last three days including Qualifier rides. Achille Donnais of France on Queops des Aubepines finished ahead of the UAE's Khalifa Ganem Al Merri on Ridasa Brinda with just 26 seconds separating the two riders in the President's Cup for Juniors and Young Riders which was a Two-Star ride over 120 km. A sole British endurance rider has been invited to start in the FEI three-star 160km President's Cup ride across the Abu Dhabi desert next month. Dorset veterinarian Catriona Moon, who has twice been part of the senior British Endurance team, will start in the race on February 11 on her 13-year-old mare Leila. The President's Cup is one of the toughest endurance rides worldwide. The 160km course is across the desert and will include crossing steep sand dunes. The combination, which finished strongly in the 2011 FEI European Endurance Championships in Florac, France, have been training hard for the competition. "It is likely the temperature in Abu Dhabi will be in the high 20s," Moon said. "Leila has been wearing lots of rugs and is training with two exercise sheets to try and get her used to being warm which isn't easy in the British winter." The pair will fly out to Abu Dhabi on February 7 with their crew, Catriona's mother, Jackie Moon, and Zofia Lisowski. Endurance GB's Emma Miller said: "We are delighted Catriona has been invited to take part in the Presidents Cup, she really deserves this chance and we wish her and Leila the best of luck." Endurance GB will be following Catriona and Leila's progress on its Facebook page, at www.facebook.com/EnduranceGB. Abu Dhabi: Munder Ahmad Al Beloushi of Al Reef Stables and Hassan Abdullah Yousuf Al Hammadi of Al Wathba Stables won the Emirates Challenge and the Giants Endurance Challenge (Round 1) 120-km rides, respectively, at the Emirates International Endurance Village in Al Wathba yesterday. His Highness Shaikh Mohammad Bin Rashid Al Maktoum, Vice-President and Prime Minister of the UAE and Ruler of Dubai, Shaikh Hamdan Bin Rashid Al Maktoum, Deputy Ruler of Dubai and Minister of Finance, Shaikh Hamdan Bin Mohammad Bin Rashid Al Maktoum, Crown Prince of Dubai, and Shaikh Mansour Bin Zayed Al Nahyan, Deputy Prime Minister and Minister of Presidential Affairs, attended the ride. Abu Dhabi: Dubai schoolgirl Fatima Jasem Al Merri once again displayed her skills as she managed to finish ahead of two foreign riders to win the Shaikha Fatima Bint Mansour Bin Zayed Al Nahyan Ladies Endurance Cup at the Emirates International Endurance Village in Al Wathba yesterday. Al Merri, who won the National Day Cup at the same venue earlier in the season, won a close battle riding her eight-year-old gelding Hurst Radnor, with just 36 seconds separating the top three riders after the 90km race. Al Merri, who also made the UAE proud by becoming one of the first two woman jockeys to take part in a flat race in the Netherlands last year, took the lead in the second stage of the four-stage race but was given a close fight in the final loop by New Zealand's Lauren Michelle Hiscock on Tora Conrad and French rider Geraldine Jacquet on Kaysand Farrazah. KUALA TERENGGANU, Jan 18 (Bernama) -- Sultan Terengganu Sultan Mizan Zainal Abidin will be among participants in an Endurance Horse Race competition organised by the Al-Kathiri Equestrian Club in Lembah Bidong, Setiu on Saturday. Club chairman Shaikh Abdul Halim Al-Kathiri said the race was the first of its kind organised in Terengganu by an equestrian club. According to a statement from the Terengganu Menteri Besar''s office, the race that will feature a 50km and 80km race will start at 6.15am. Sheikh Abdul Halim said about 50 local riders would take part in the competition. A HORSE rider from Chesham has won a prestigious national award. Lorna Kidson, 29, of Chartridge Lane, Chesham, was announced as the winner of the runner-up prize for the South Essex Insurance Brokers and Retraining of Racehorses' Elite Performance Award for Endurance, at the Breeders Dinner and Awards Ceremony at the Grange Hotel, London, last week. Kidson, who is an insurance underwriter at Royal and Sun Alliance, in High Street, Chesham, scooped £500 for winning the accolade. Abu Dhabi: Young Abdullah Ganem Al Merri of Nad Al Sheba Stables partnered Shardell Alladeen to win the prestigious His Highness Shaikh Mohammad Bin Rashid Al Maktoum Endurance Cup, a 160-km Three-star ride held at the Dubai International Endurance City yesterday. After Shaikh Hamdan Bin Mohammad Bin Rashid Al Maktoum, Crown Prince of Dubai, retired his horse when leading in the penultimate stage, Al Merri got the better of Bahraini rider Ahmad Abdullah Al Hazza on Picaflor with their close battle going all the way to the final kilometre before the UAE rider won by 27 seconds. Our friend and Kaliber Andalucia President Jose Manuel Soto, sends us an email and a letter, telling him that this year 2012 will be the Kaliber. Spanish and World crisis has hit the world of the horse and could not be unless you play at this great test, test that too many riders have the illusion of enjoyment, and José Manuel looking for cheaper solutions, explains in this letter, which wants to do in this year 2012. The idea looks like it may be, is not the same go half Andalucia, to be anchored to a village, but this place is special, nestled inside the Doñana Paque, a place where they worship the Blessed Virgen del Rocio, horse landmark in the village meets during the pilgrimage, thousands of fans with their horses to enjoy those walks in the sand marshes. Many of you're asking me about this year's raid, and I think it's time to give you an explanation. In 2012, due to the difficult economic situation we are going, we can not celebrate the Raid Kaliber-Andalusia as you had known before. We had been several years working their way through the longest and toughest test in the world despite the many difficulties of all kinds that we face, to face them with hope and enthusiasm, but This year we have lost all support we had and we can not continue. You can imagine the shame that this happens to us all that we fought so hard over the years by bringing forward this dream, but circumstances force us to send and adapt if not to resign. 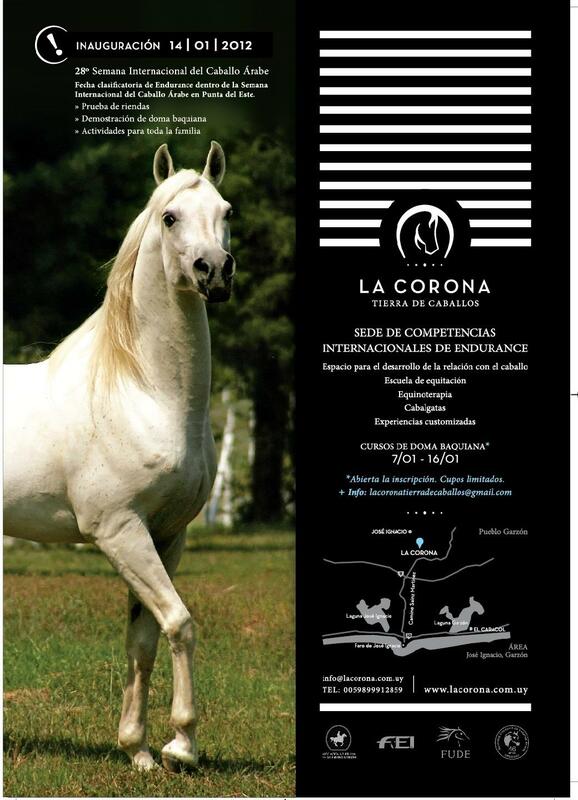 Our intention is not to lose the habit of doing a great race every spring in Andalusia, and especially not to lose the habit of meeting and share what most unites us: our love for horses. 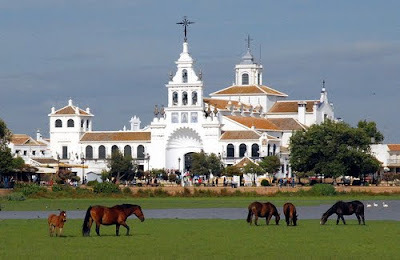 Therefore, I propose a great weekend of horses and friendship in the village of El Rocío coinciding with Easter. We can not give big awards, or write great reports as before, but if we can share good times and compete healthily with our horses, which are also our passion. The idea is to hold three races of 80 km each, in two stages a day, starting and finishing in the village of El Rocío, going through the incomparable landscapes sandy, covered with pines, Doñana and its beaches. And that everyone may want to run phases, establishing several classifications. I think it's a much more affordable adventure from every point of view, although not without strength and competitiveness for those who decide to try to run all phases. The horse better classified which cover all stages be given the prize "Ironhorse" of the year. And that, precisely, is the name of this new career: "Al-Andalus Ironhorse." From here I encourage everyone to fellowship and be convinced your friends, relatives and acquaintances to come and enjoy a few days together and healthy rivalry and that we all return to give an example of what this beautiful game. Many thanks to everyone and my best wishes for the year just to start. President of the Organizing Committee"
Top French riders will be among 200 participants at the His Highness Sheikh Mohammed bin Rashid Al Maktoum Endurance Cup CEI*** to be held at the Dubai International Endurance City (DIEC) course on Saturday. They will be among 20 overseas riders from Bahrain, France, UK, Italy and Spain who will be vying with Emiratis for top honours in the fifth running of this presitigious event presented by Longines, the official timekeeper of Meydan Group, and supported by Emirates Airline, official airline of Meydan Group. The event annually serves as the highlight of the Dubai Endurance season bringing together some of the world’s greatest riders to test their skills over the 160km challenge Organised and hosted by the Dubai Equestrian Club. The ride is scheduled to start 6.30 am at DIEC in the Seih Assalam area of Dubai, adjacent to Bab al Shams Desert Resort. Nina Lassarague, 18, will be the youngest competitor at the event. Representing France at the World Junior Endurance Championships held in Abu Dhabi, Nina was placed second in the team event along with Led Vogles, who has been taking part in the Sheikh Mohammed bid Rashid Al Maktoum Endurance Cup for the past three years. Cecile Demierre, Roland Vera and Laurent Noshi are the other French riders who are ranked among the top 10 back home. “The Dubai Equestrian Club is once again honoured to offer the HH Sheikh Mohammed bin Rashid Al Maktoum Endurance Cup to the world of endurance riding that includes the competitors, crews, officials and all the people that make this great sport possible,” said Mohammed Essa Al Adnab, Deputy General Manager of the Dubai Equestrian Club at a press conference to announce the event at Medyan on Tuesday. “Ensuing from its partnership with the Meydan group, we are delighted to announce that Longines is the presenting sponsor and official timekeeper for the HH Sheikh Mohammed bin Rashid Al Maktoum Endurance Cup,” said Juan-Carlos Capelli, Vice-President and Head of International Marketing of Longines. In a fitting tribute to honour the spirit, masterful skills and determination of the winning rider, Longines will bestow the HH Sheikh Mohammed bin Rashid Al Maktoum Endurance Cup champion with a stunning timepiece, The Longines Column-Wheel Chronograph Gold. “Emirates has a strong affiliation with horse racing events and equestrian sports around the globe and we are incredibly proud to announce our sponsorship of the 2012 HH Sheikh Mohammed bin Rashid Endurance Cup,” said Khalid Al Haddad, District Manager Sharjah and Northern Emirates for Emirates Airline. The event will be divided into five stages. After the completion of each stage, the horses are rested and refreshed and undergo a veterinary exam to determine if they meet the physical standards to continue the event through the next stage. The horse that finishes first, as well as all finishers, must successfully complete a post-race veterinary exam to determine they did not exceed the physical standards set forth by the sport. It is only after the final veterinary exam that the official order of finish is determined and announced. South Africa: PSV Mauser – 1st barefoot SA horse to go to the World Champs! Size does matter. There are more endurance horses disadvantaged by being too big, than those that are too small. 14.3 is our favourite size. Perseverance Mauser is a purebred, 14.3 Arabian gelding. His grandsire was the Polish Arabian stallion Khyberie. Khyberie has produced many top endurance horses. The rest of Mauser’s pedigree is predominantly Crabbet/ Old English. Mauser is the complete all-rounder – over any distance, in any condition, and with any rider he does incredibly well. This year alone he has done two FEI *** hundred milers, one with a Standardweight rider in 9h49, and the other with a Heavyweight rider in 10h09. He was entered in his first Fauresmith 201km ride, and came 17th in the Young Riders, and he did brilliantly in the soft sands of Dune 7 at the Walvis Bay African Championships, and placed 11th in the Heavyweights! Mauser was the Eastern Cape Young Rider Champion horse at rocky Schanskraal in 2010, where he finished the 120km in a blistering 5 hrs 53 min.He also took first place at the 2011 Lormar120km in atrocious conditions – pouring rain and oceans of mud – but this time with a Heavyweight rider. In April this year in the heat and sand of the South African International Challenge at Modimolle, he completed the 120km in 6h49, to help the Eastern Cape Young Riders team to 3rd place! BOBS Farm resident Allix Jones, 19, has finished runner up in the Youth Endurance World Riding Championship held in Abu Dhabi. Part of a team of four girls representing Australia,the impressive result in the 120-kilometre event, which took place in December, has lifted her towards the sport's top tier, and helped to secure an impressive team bronze medal for the country. THE Bahrain Royal Equestrian and Endurance Federation (Breef) decided to organise an endurance horse ride for the disabled during next week's King Hamad Championship, scheduled for February 4. The disabled ride, to be held on the sidelines of the main event that will be over 120km, will cover 5km distance and consists of just three stages. This ride will be organised in the sidelines with the directives of Breef president Shaikh Khalid bin Hamad Al Khalifa, who also patronised a disabled race last week during the weekly horseracing meeting held at the Rashid Equestrian and Horseracing Club in Sakhir. Shaikh Khalid expressed delight for the tremendous success of the most recent Breef Endurance Team Championship held last weekend, which was won by Al Khalidiya Stable team. The Breef's chief stressed the federation's keenness to continue working on further improving and developing its programmes this year. He congratulated the winners in both the team and individual rides of the endurance championship, and praised the brave performance of the other teams taking part, which made key contributions to the success of the event. India: Is Gujarat’s Kathiawari breed galloping towards extinction? Ahmedabad: Their endurance can put Arabian horses to shame, their loyalty is unmatched and their temperament extremely fiery. Yet, despite such traits, the Kathiawari horse—an indigenous breed of Gujarat — is facing a decline in numbers. Of the total six identified and accepted breeds of horses in India, the Kathiawari is the only one that is facing a threat of extinction. Experts who attended the Horse Show-2012 held at Dholera on Sunday said that the number of pure-bred Kathiawari horses is very low. They said that cross-breeding, a paucity of better-looking horses and a general lack of demand have led to this situation. Some of them peg the number of ‘pure bred’ Kathiawari horses to as low as 40. Perhaps this could explain why the Centre and state government are working on a plan to revive the breed. “The number of pure bred Kathiawari horses is quite low. It should be noted that any breed whose number falls below 10,000 runs the risk of extinction and the Kathiawari breed definitely falls in this category..."
photo:Taleb Dhaher Al Muhairi, secretary-general of the Emirates Equestrian Federation (EEI), Adnan Sultan Al Nuaimi, director general of the Abu Dhabi Equestrian Club, Lara Sawaya, director of the Shaikh Mansour Bin Zayed Al Nahyan Global Arabian Flat Racing Festival, Nafez Abbara, project manager of SAS Investment Co LLC, and Mann Abu Saleh, proprietor of Samawi Neon, present the trophies to the winning trio. Abu Dhabi: Tayef Atiq Sabt Al Falahi representing the W'rsan Stables based in the capital won the 120km Al Wathba Challenge endurance ride by a narrow margin at the Emirates International Endurance Village (EIEV) in Al Wathba yesterday. Riding 12-year-old bay Arabian gelding Glenmorgan, Al Falahi was involved in a close battle for the finish before prevailing by 16 seconds from Thani Mohammad Al Muhairi on Razorback Wildfire from Seeh Assalam Endurance Stables with Mohammad Sulaiman Rashid Al Marbouei on Asraf Amir from Dubai Endurance Stables finishing a close third. Al Falahi and Glenmorgan completed the five stage 120km event in which a large field of 163 riders contested in four hours, 24 minutes and 32 seconds. It was Al Falahi's first 120km ride win in the UAE though the W'rsan Stables' rider had earlier tasted success in a similar ride in Malaysia. "It was a very tough contest. I just decided to ride at an average speed of around 26kmph in the first four stages and my horse did well to respond to that," said the winner. "It was only in the final loop that I pushed my horse and we managed to win this prestigious ride," he added. Al Muhairi on Razorback Wildfire finished second in 4:24.48 while Al Marbouei on Asraf Amir was timed at 04.25.05 in third place. Shaikh Hamdan Bin Rashid Al Maktoum, Dubai Deputy Ruler and UAE Minister of Finance, and Shaikh Mansour Bin Zayed Al Nahyan, Deputy Prime Minister and Minister of Presidential Affairs, attended the ride in which Shaikh Hamdan Bin Mohammad Bin Rashid Al Maktoum, Crown Prince of Dubai, also participated. The 120km ride was run in five stages of 33, 27, 24, 20 and 16 km and the prize fund on offer was Dh350,000 including a car for the winner. Taleb Dhaher Al Muhairi, secretary general of Emirates Equestrian Federation (EEI), Adnan Sultan Al Nuaimi, director general of Abu Dhabi Equestrian Club, Lara Sawaya, director of the Shaikh Mansour Bin Zayed Al Nahyan Global Arabian Flat Racing Festival, Nafez Abbara, project manager of SAS Investment Co LLC, and Mann Abu Saleh, proprietor of Samawi Neon, presented the trophies to the winning trio. AL KHA- LIDIYA Stable were crowned overall champions in the Breef Endurance Horse Ride Team Championship yesterday. The third endurance event of the season, held at the Bahrain International Endurance Village in Sakhir, was open for teams and was over 120km. The ride was divided into five stages, with the first two stages covering 30km each. The third, fourth and fifth stages were over 20km each. Competing with several stables from across the kingdom, Al Khaldiya team came on top with a combined total ride time of 16 hours, 45 minutes and 39 seconds. Spearheading the victors were Abdulrahman Al Zayed, Ali Baqer, Salman Isa and Yaqoub Yousef. Finishing second were Al Asayel team of Abdulla Al Qassmi, Fahad Sulaiman, Mohammed Saif and Khalifa Mubarak who completed the event in 18 hours, 58 minutes and 49 seconds. In the individual ride, which was also over 120km, Royal Endurance Team riders lived up to many expectations, securing a 1-2 finish in style. Riding Kintamani, Royal Endurance Team star Abdulrahman Al Saad raced to victory in five hours, two minutes and 34 seconds with a 23.796km per hour speed average. Al Saad, who led the ride right from the start, was followed by teammate Abdulrahman Al Zayed (5:14:05) who came second on Zabubega, while Al Khalidiya Stable's Ali Baqer (5:40:02) rounded off the podium while riding Derrom. In the day's other ride, an 80km event which was open for new riders, Salem Mubarak Sabt of Al Asayel Stable clinched victory in five hours, 15 minutes and 30 seconds with a 15km per hour speed average. Behind him was Karam Al Belooshi (5:15:31), also of Al Asayel, in second place with a similar speed average of 15km per hour. The event was witnessed by Supreme Council for Youth and Sports chairman and president of the Bahrain Olympic Committee Shaikh Nasser bin Hamad Al Khalifa who presented trophies to the top three in the team and individual rides. Also attending the ride were Bahrain Royal Equestrian and Endurance Federation president Shaikh Khalid bin Hamad Al Khalifa, Shaikh Sultan bin Hamad Al Khalifa and other federation officials. Shaikh Nasser, the Royal Endurance Team captain, praised Al Khalidiya Stable's victory, which underlines the team's keenness to win podium. Shaikh Nasser said the ride was excited and lived up to expectations. He said the Royal Endurance Team were leading the team event in the early stages, but the elimination of some team members from the race proved vital. Shaikh Nasser congratulated Royal Endurance Team member Al Saad on winning first place among individuals, and wished other team members progress. Abu Dhabi: Ahmad Mohammad Al Jaber Al Merri won the 100km Shaikh Zayed Bin Mansour Bin Zayed Al Nahyan Endurance Cup for the second consecutive year to drive away with the car which was the winner's prize at yesterday's event. Al Merri rode nine-year-old Anglo-Arab chestnut Highland View Dolly to a superb win at the Emirates International Endurance Village to once again top the event, which is open only to privately-owned horses. The university student had last season won this 100km UAE national ride on Shardell Sharana Golden and yesterday he repeated that feat, this time finishing on top of a 78-strong field. Abu Dhabi: The Shaikh Zayed Bin Mansour Bin Zayed Al Nahyan Endurance Cup for horses owned by private owners and the Al Wathba Challenge open ride will be held today and tomorrow respectively at the Emirates International Endurance Village in Al Wathba. The rides are organised by the Emirates International Endurance Village and the Abu Dhabi Sports Council, while SAS Investment Co LLC, Al Wathba Stables and Samawi Neon are the sponsors of the event. Today's 100km Shaikh Zayed Bin Mansour Bin Zayed Al Nahyan Endurance Cup for horses owned by private owners is a UAE national ride and will start at 6.30am. The ride will be run in four stages of 33km, 27km, 24km and 16km. A large number of riders are expected to start in this event, which is being organised to encourage small and private stables to compete against each other and give them a better chance. Tomorrow's Al Wathba Challenge will be run over a distance of 120km. The event is an FEI two- star ride. It is supported by the Abu Dhabi Sports Council, SAS Investment Co LLC, Al Wathba Stables and Samawi Neon. The ride is an open event which will start at 6.30am and will be run in five stages of 33km, 27km, 24km, 20km and 16 km. Attractive prizes are on offer for the winners of the two rides. THE Breef Endurance Ride Team Championship, is scheduled for tomorrow at the Bahrain International Endurance Village in Sakhir. Organised by the Bahrain Royal Equestrian and Endurance Federation (Breef), the ride is the third event in the 2011/12 season and will feature a team competition. It will feature two rides, the first of which is the main ride and will cover 120km. An 80km qualifier will also take place on the sidelines of the main event. Tomorrow's rides will be held under the patronage of federation president Shaikh Khalid bin Hamad Al Khalifa. The 120km ride, which begins at 6am, is open for horses aged six and above, with a minimum weight of 75kg and a maximum heat rate of 64 beats per minute, while minimum speed should be 12km per hour. It's been divided into five stages - 30km each for the first and second, 20km for the third, 20km for the fourth and 20km for the fifth. In the 80km event, due to commence at 6.15am, the organisers approved three stages. The first stage is over 30km, to be followed by another 30km for the second, while the third and final stage will cover 20km distance. Riders should be at least 14 years old to participate. The maximum heat rate is 64bmp with a minimum allowed is 70kg and also 12km minimum speed average required. The veterinary examination for both rides are scheduled for today from 3pm to 5pm at the veterinary area in the village. The awarding ceremony will be held at 1.30pm on a purpose-built stage at the village, where the top three teams will be honoured. Following this weekend's ride, the federation will continue preparations for His Majesty the King's Cup ride, the main event of the endurance season, that will take place on February 4. It will be followed by the Shaikh Nasser bin Hamad Al Khalifa Ride on February 18. The Breef Championship will then take place on March 2. The following event on the Breef calendar will be His Royal Highness the Crown Prince Cup night ride on April 6, while the End of the Season Ride will be held on April 5.
it will be a pleasure for us to count with you presence in our opening ceremony. Martin Ochoteco, a world well known horse trainer, and more. children area, and endurance education. for their 1st Place Champions in the Endurance World Cup in Abu Dhabi.